If you are going to visit UK for touring you apply for this Visa. If you are visiting family in UK you should apply for Family Visitor. The family member should be a UK citizen, settled in UK, granted asylum by UK government or have Humanitarian Protection Status. The key to a successful application is genuine intent to visit, accurate documentation & forms. If you are from China and want to visit UK, you can apply under Approved Destination Status [ADS]. The validity of this Visa is 30 days. Other costs, such as the costs of health assessments, and police certification, if required should have to be borne by you. 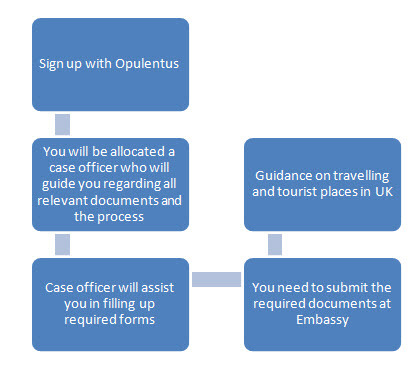 Once the client receives his/her UK Tourist Visa, Opulentus offers services for hassle free travel and stay.